A new marine communications system developed with ESA support is allowing ships to optimize their bandwidth use at sea. The Sass@sea system has been developed by MediaMobil as part of the Advanced Research in Telecommunication Systems (ARTES) program. During a pilot lasting four months, the satcom-based system was put through its paces in the challenging environment of trans-continental tanker shipping. Sass@sea was used for all official and private applications between ship and shore on five tanker vessels operating in the North Atlantic, US East Coast and Baltic Sea regions. A capable communication system on tanker ships is essential for safety and can also improve the efficiency of vessel management systems. This includes reporting, planned maintenance, telephony and Internet as well as high-volume applications like server synchronization and document management. Carrying out these activities at sea saves time and paperwork. The system is currently in use on the TMS Seahake and four other tankers in the fleet belonging to German Tanker Shipping GmbH & Co KG, who quickly saw the potential advantages of the system. 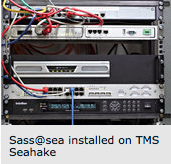 Sass@sea offers communication system flexibility by automatically switching between the onboard regional VSAT system, global satellite and mobile phone systems, depending on the performance, cost and availability of the link. This is managed intelligently by onboard and shore-based Multi Services Gateway Systems which find the optimum route for traffic. The Sass@sea system is also designed to integrate other potential networks such as Ka-band systems, effectively ‘future proofing’ the system. The shore-based systems assign bandwidth on demand, with prioritization at application level within the fleet, ensuring that business applications such as voice, email, ship management software and remote desktop support sessions receive priority. The rest of the bandwidth can be used on the basis of availability for non-critical web surfing. There is also a facility for store-and-forward transmission of low-priority traffic in multicast and unicast mode during off hours, which maximises the use of valuable satellite bandwidth. The Sass@sea service can switch to different satellites with the antenna selecting the optimum beams, partly depending on the vessel’s position. It can switch according to the ship’s heading in order to avoid antenna blocking. It can also delay switching satellites to prevent phone calls and other high-priority traffic from being interrupted. The system also switches between regional satellite beams depending on the available bandwidth in each beam to optimise the quality of service within the whole network. According to German Tanker Shipping, the Sass@sea system offers a more cost-effective communication system and increases the efficiency of management systems on board ship. Satellite communication facilities also enable crewmembers to keep in touch with friends and family at home, which can be a great advantage on vessels away from shore for long periods of time. “We see the commercial potential of our maritime communication service in the fact that due to the increased use of business application and the growing IT infrastructure on board the vessels, the requirements for an always-on communication with guaranteed quality of service at affordable prices will grow as well,” says Andreas Nil. 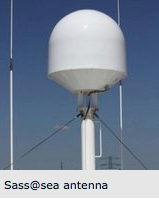 The Sass@Sea project built upon work from a previous ARTES project that developed a lightweight signalling protocol for interconnection of alarm and security systems via satellite.